The latest data shows that the number of monthly active WeChat users has reached 1 billion (MAU). Although its growth rate in the third quarter of 2017 was 15.8%, there has been no doubt that the growth rate has steadily decreased. With the slowdown in the number of WeChat users, Tencent is taking advantage of WeChat as personal connection, commercial and service bridges to drive user growth. 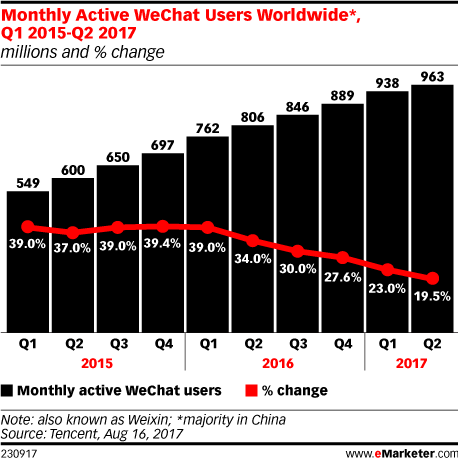 Although WeChat has a large and stable user base in China, it has been fighting for a large number of users outside of the national market. According to eMarketer’s estimation, by the end of 2018, the number of mobile Internet users in China will reach 728 million, which is only half of the total population of 1,400 million. From this point of view, WeChat has still room to grow. However, getting new users will be increasingly difficult, and the cost will be greater. Artificial intelligence (AI) applications, such as face recognition and predictive analysis, allow users to interact with applications in a more natural way. Mobile payment is also an important part in Tencent business. 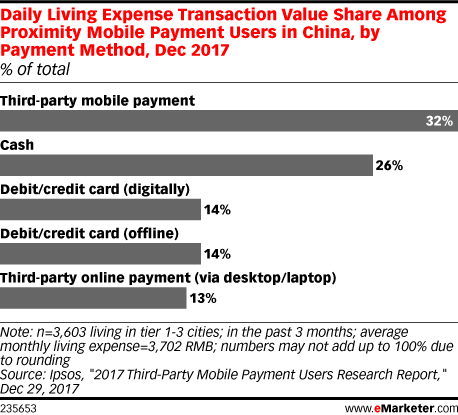 The cashless society is rapidly gaining popularity in China, and the WeChat payment is playing an increasingly important role in supermarkets, street stalls, taxis and even public transport. These important mobile applications now provide a new impetus for the growth of WeChat users.